Introduced in 1994, it was originally just £5 per person for short-haul flights, and £10 elsewhere. 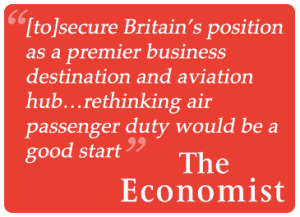 Successive governments have increased APD, so that passengers now pay up to £150 on long-haul flights. A report by the Centre for Economics and Business Research shows the annual contribution to the UK economy of the leisure aviation industry is £14.1bn. In September 2017, the World Economic Forum published its latest biennial Travel and Tourism Competitiveness Report. The UK is ranked 133 out of 136 countries in their global Travel and Tourism Competitiveness Index for air passenger tax and airport charges. The British Chambers of Commerce calls APD ‘a trade tax on global traders’. The CBI, IoD and many other leading business groups have also highlighted its damage. The high level of APD places the UK at a competitive disadvantage when compared to our European neighbours, with our APD the highest throughout Europe. This makes trading overseas and attracting inward investment more expensive. APD is the highest European aviation tax for short-haul and long-haul flights and is the highest rate of tax for long-haul flights in the OECD. The UK is one of a handful of European countries to levy an air passenger duty, and in recent years many countries have abolished their equivalent taxes in order to become more competitive. Ireland abolished their air travel tax in 2014 to stimulate their economy. PwC has published research which found that significantly reducing or abolishing APD would create tens of thousands of new jobs. It also found that reducing or abolishing APD would actually increase the revenues to the Treasury from other taxes so much that it would pay for itself – increasing the amount money flowing into the Exchequer. Following the Smith Commission’s report (2014), the Scottish Government has announced plans to reduce APD on flights leaving Scottish airports by 50%. A Fair Tax on Flying welcome the Scottish Government’s recognition that APD is an uncompetitive and damaging tax. However, Government modelling has shown that any reduction of APD in Scotland would have a detrimental impact on airports and other travel businesses in other parts of the UK, and distort the highly competitive aviation and tourism marketplace. We therefore urge the UK Government to act before disparate APD rates affect the economy of the UK as a whole. A cut in APD in Scotland should be matched by the same cut across the rest of the UK, so that no part of the country is disadvantaged in any way.